Satire is a type of literature that uses different techniques--such as humor or irony--that make fun of the subject in order to express ones judgement or view of that subject. 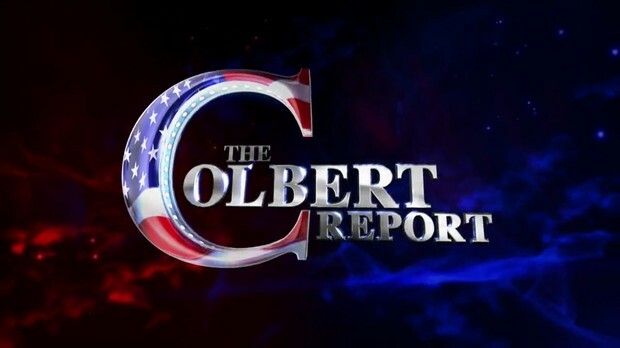 The Colbert Report is an example of a T.V. show that uses satire. What are the tools of a satirist? 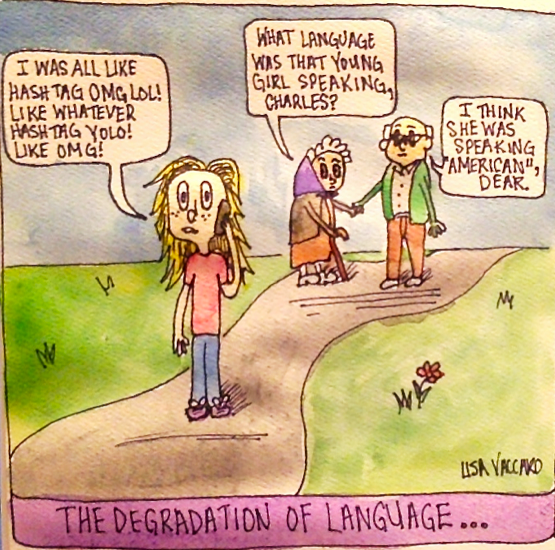 This type of satire exaggerates the subject to draw emphasis to it. Satirists use this tool when they want to make their subject seem very abnormal, helping the viewer to see it as the satirist does: ridiculous. Enlarging or increasing the subject allows the viewer to see the faults. This can be done in cartoons by enlarging a physical feature or trait. Satirists use incongruity by placing their subject in an absurd situation. Often, the item using this type of satire includes oxymorons, metaphors, and irony. The subject is out of place and does not fit in with it's surroundings. This technique features the opposite of the normal. A satirist may use subjects that switch the order of events such as having breakfast for dinner, or subjects that reverse the order of authority such as having a baby boss his parents around. A parody imitates a certain other piece of work or situation in order to express criticism or comments on the original. 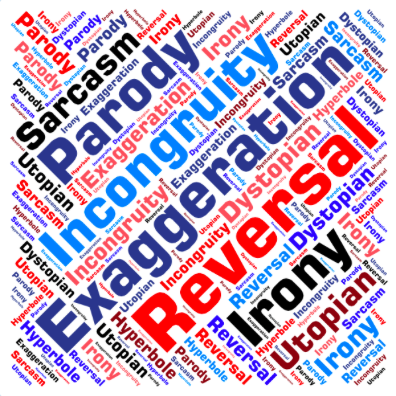 The audience of parodies must have seen the original for the satirists parody to be understood. In a way, parodies make fun of the original person, place, or thing by echoing the techniques and/or style that was originally used. 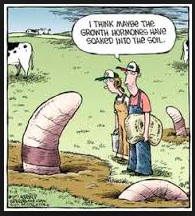 "I THINK MAYBE THE GROWTH HORMONES HAVE SOAKED INTO THE SOIL." This satirical cartoon uses exaggeration. In the cartoon, there is a huge worm growing out of the ground. The artist enlarged the subject in order to prove their point. The satirist is probably conveying their idea that growth hormone will effect other species other that the one that the growth hormone is being used on. They are dangerous and the artist of this piece of satire exaggerates how growth hormones can affect the world around us. This satirical cartoon incorporates the technique of incongruity. The comic includes a metaphor and the subjects are out of place and do not fit in with their surroundings (for example, one does not usually see an alligator riding in a boat). There is a lot of symbolism in this cartoon. The comic is clearly extremely liberal. The hillbilly in the picture is wearing a hat labeled "Senate GOP". GOP is an abbreviation of "Grand Old Party", which is a nickname for the United State's Republican party. The liberal artist made this character a hillbilly because, in his opinion (and the opinion of many other Democrats) the Republicans do not know anything and therefore have the education of a hillbilly. 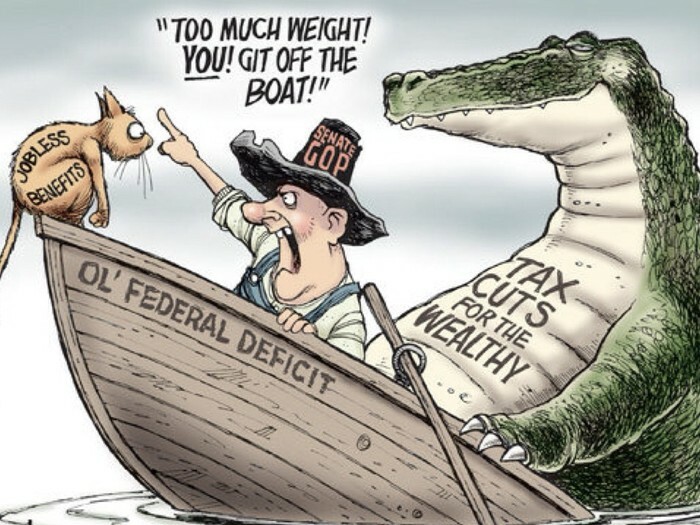 The huge alligator is labeled "Tax cuts for the wealthy" and represents the rich people that receive tax cuts. The cat is labeled "Jobless benefits" and is being told to get off of the boat. The satirist is conveying their idea that Republicans blame things on the wrong group in summary. "AWWW! THEY'RE SO CUTE WHEN THEY FALL ASLEEP ALL SNUGGLED UP WITH THEIR FAVORITE PHONE." This satirical cartoon uses reversal. The authority in this comic is opposite of what is normal because the young children are talking about their dad as if he were a baby and they are the parents, while the dad is lying on the floor, sleeping, and sucking his thumb as if he were a baby. One of the messages that the artist is trying to convey through this piece of satire is that phones have become comforting to adults. Adults have turned into babies that are the most peaceful and comforted when their technology is with them. So, what is satire again? Artifact 1: What is Satire?